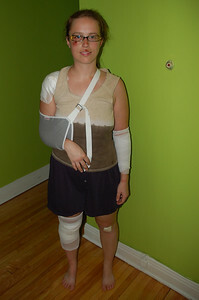 Being one of the most skilled downhill road cyclists (as exhibited in Lachute, Quebec, see photo below), Emilie was keen on the possibility of cycling down the highest motorable pass in the world and redeeming herself. 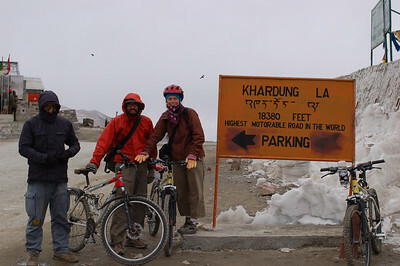 After some debate about safety we decided to rent mountain bikes and tackle the descent down Khardong La. The day started at early in the morning when we went to inspect the bicycles, which we had promised would be "top quality international brands". It took a few minutes for us to each select a bicycle that we thought would make it through the 40km ride. It took some convincing to get the owner to repair various problems. The bicycles were decent but they obviously hadn't been maintained, probably not having been touched since last season. As part of our budget deal, we got a ride up to the top of Khardong La in the most beat up pick-up truck in Leh. Emilie rode in the front of the pickup to entertain the driver while Jochen and I were crammed outside in the back with the three bikes. 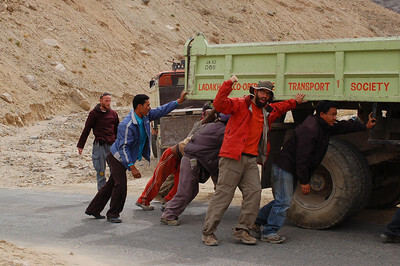 It was a miracle that the truck actually made it up the pass, on steeper parts we frequently stalled. Showing off the local driving skills was a truck perched perilously on the edge of the road being pulled out by a tow truck, Yann and Jochen contributed in some sorts to the rescue. As the three hour drive progressed, I started to burp, alot. What made the burping special was that they filled my mouth and the air with a potent smell of rotten eggs, totally delicious!!! On the last bit of the climb, Jochen and I where started to feel the fact that we were now over 5000m, we hadn't really factored the cold weather into our plans. Arrived at the top we quickly unloaded the bikes took a few pictures and ran into the tea hut. The wind was blowing strongly making the near 0 degree temperature even more numbing. Emilie had bought a pair of gloves earlier which I thought would be a frivolous buy, but now it was clear that without gloves the ride down was going to be extra painful. Emilie purchased a new pair of gloves from the slightly over-priced Khardong La gift shop (amazingly and luckily you buy wool gloves there to go along with your Khardong La commemorative coffee mug) so that I wouldn't lose my fingers. We drank tea in a vain attempt at warming up with the Indian tourists. The first 500m descent (in altitude) was too cold for comfort and to make matters worse the suspension and the brakes of our bicycles were stiff (Emilie hardly had the strength to squeeze the breaks). Meanwhile adding to the fun, my burps where getting more frequent and nastier in smell and I was quickly becoming increasingly weak. It's important to note that eggs had not been part of our diet for many days. We continued our descent stopped for lunch at the military check point for some tea and Maggi noodles (Indian instant noodles). Up to this point, we had followed the road down the pass. We decided that continuing off road would be fun, despite the fact that it was the first time Emilie had ever sat on a mountain bike. This might in fact have been fun if it weren't for my deteriorating strength the steep trail littered with 10cm radius loose rocks. Emilie was good for her first time since it was a technical terrain for an introduction to mountain biking. After a while, it was clear that I couldn't continue on the rocky trail and would have to get back on the road. Of course we were now 100m straight down from the highway. Emilie and I began lugging our heavy bikes up the sheer mountain face, at an excruciatingly slow pace. Benevolent Jochen would continue on the cross-country trail but not before carrying my bike all the way up to the road then hiking back down to meet Emilie (who had almost made it halfway) and carrying hers the rest of the way up. Once back on the nicely paved road Yann and Emilie were able to easily finish the descent, meeting up with Jochen at the bottom and racing through the narrow country roads leading to Leh. In town, Doctor Jochen concluded that Yann must have giardia (a stomach parasite which he had just recently gotten over himself) and Nurse Emilie headed to the pharmacy to by some prescription drugs over the counter. After only one dose of medication Yann's burps disappeared, and within a few days he was back to his usual form and Emilie had made it down the mountain in one piece so we were all happy. That photo (the injury photo that made me and likely other readers FREAK out) made me race through your posting trying to find out what happened and if you were ok, then got to the end and you were fine...? Soooo...I went back and slooowwwwly re-read the posting and figured out it was a photo from your spill in Montreal (I should have recognized those distinct green walls). Anyway....very relieved to hear you're fine. Cool biking adventure!